Glo know as the grand master of data in Nigeria has recently roll out a new service called "Glo Data Calculator" that will help subscribers run an estimate of internet data volume — that can be used at a particular time. With this service, you can calculate how many MB or GB that can serve you in a month before you go on to subscribe. Globacom publicized that Glo Data Calculator will serve subscribers —better by engaging them more on the network and allowing them to determine their data usage and consumption pattern. 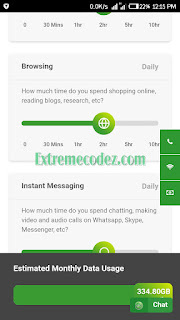 Glo data calculator also allows you determine — the total volume of data need to use social media, browse websites, download music, stream videos etc within a month. Under Glo Data Calculator, Glo customers will choose monthly data entries, followed by details — of various online activities including emails sent and received per day, and hours of streaming music — (Music, Apple Music and others in Minutes/Day) to calculate usage". First, visit Glo Calculator Page. You will see several options of data usage medium including social media (Facebook, Twitter, Instagram, WhatsApp, Snapchat etc), web browsing, streaming of videos on YouTube, Netflix, etc and many other options. Now to calculate the estimated data volume, drag the share icon within the lines separated by minutes and hours as you can see from the screenshot below. Assuming you use social Media 30 minutes and Browse the internet 30 minutes per day, Glo estimated that you need a data volume of 4.03GBfor a month. This very good development for glo users we really think it will do many glo subscribers good in terms of using their data. Globacom publicized that Glo Data Calculator will serve subscribers better.